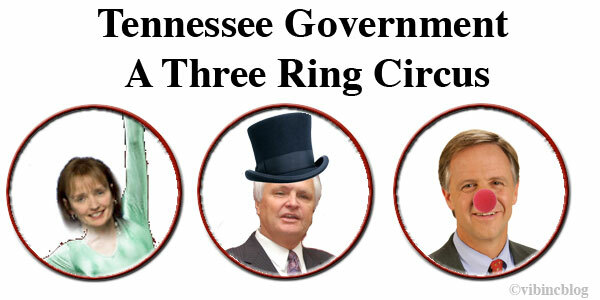 The Three Ring circus adjourns…for now. On Friday, the Tennessee General Assembly adjourned for the year, an event that was largely overshadowed by a series of national and statewide events that dominated coverage last week. There have been a lot of post-session roundups. From the measured but extensive coverage of Tom Humphrey, to the more snark driven flourishes of Jeff Woods. The one thing Tennesseans can take to the bank is that the GOP led state legislature focused on just about everything except helping them take more to the bank through economic development or reducing healthcare costs. The one thing the legislature did focus on was legislation intended to further the ideological aims of those who seek to send public money to private companies en masse. The school voucher bill, a top priority for the Haslam Administration, died when a certain Senator from Germantown wouldn’t let go of his designs on upping the ante. Another school related bill suffering the same fate was House Speaker Beth Harwell’s pet project, an expansion of the state charter authorizer…an outright dig at the Metro Nashville School Board, who thwarted a charter operator over the ruling of the State Dept. of Education in the fall. One final school related bill that did make it out of the contentious final days was a bill that allows “for-profit” organizations to operate charter schools. This bill happened so late in session, and among so many other things that I had to call the Senate Clerk’s office to confirm that it had been passed as the vote hadn’t been updated on the General Assembly website. As a side note, they were very helpful and tracked down the vote for me in mere minutes. Good job on that. There were several bills that dealt with different kinds of justice. One such bill, which was actively pursued by Lt. Gov. Ron Ramsey, would have changed the way judicial districts were drawn in the state and reduced them by two. That bill failed Friday in a battle of wills. There’s no word as to whether it will come up again next year, as petitions for judicial elections will be released near the beginning of session. While people expecting speedy justice from the judicial branch were spared, others were not so lucky. Abused animals to the brunt of legislative beatings in the passage of a bill that would make it harder to document animal abuse. Workers seeking justice for their injuries were injured when the legislature approved changes to the workers compensation system that further tilts it against them. Municipalities seeking to ensure workers employed on government funded jobs likely took a hit to their bank accounts as a bill seeking to overturn local living wage ordinances made its way to the Governor. People living on fixed incomes, especially those who were likely poor to begin with, may hunger for a change as they see one of the most popular programs anywhere cut. Meals on Wheels, the popular program that helps poor elderly people eat, got cut $2.3m because the state’s “rainy day fund” was more important to the Governor and Legislature than elderly people that can’t get around on their own. And finally, property owners, seeking to, you know, make the rules regarding what is or isn’t allowed on their property, a foundational concept of common law, will now have to allow the storage of guns in vehicles by permit holders. Its like a liberty vs. liberty deathmatch. One good thing on the legislative front. The Shelby County Public Defender’s office did receive additional funding from the state to bring them closer to parity with other smaller PD’s. Don’t think this was kindness. Chances are, the state would have been sued by the County if this hadn’t happened. Taking a cue, perhaps, from his from his brother’s business practices, Gov. Haslam sought to bully the Feds into acquiescing to his less kind, less expansive form of the much touted but barely formed “Arkansas Plan” for Medicaid expansion. While the language may have been the normal flavor of milquetoast we’ve come to expect from the Governor, make no mistake about it, he was pandering to the far right wing of his base. “I do think there was a lot accomplished,” said Haslam. “We passed a great budget that cuts taxes, adds to the Rainy Day Fund, gives a raise to employees, has really one of the largest increases for K-12 (school) funding that we’ve had in a long time and gave a significant amount of capital (construction funding) for higher education. I both covered and predicted this would be a post-session talking point. For a good explination of just who benefits from the tax cuts, check out paragraphs 6-8 at this article in the CA. Pretty sure you won’t find your income on the list. Finally, in a dig to professional development in the state, the Governor closed 34 carreer centers statewide despite the unemployment rate increasing to 7.9%. I’m sure this money ultimately goes to business tax cuts somewhere, I just haven’t found it yet. While the worst may not have happened, this time, there’s still next year, and plenty of GOP majority to push it through. The State House and 17 State Senators, along with the Governor will be in campaign mode as they push to the November election. Expect lots of pet projects to come up again, and less strife between the House and the Senate as they push to get back to their districts as soon as possible so they can amass the cash needed to try and win another trip to Disneyland on the Cumberland. In the mean time, take a breath and know you’re safe for a few short months…assuming, of course, the Governor’s Administration doesn’t go full on Rick Scott on us. After this session, I’m not ruling anything out. I wish to all the gods I could effing ignore him. @Michelle I’m not saying it was easy. Just saying that’s what I had to do. Would have been nothing but Stacey otherwise. Susan Wilson liked this on Facebook. You were kind in your assessment of the session…. @vibinc Thanks for sharing your post. I had been looking for several of the legislative updates you wrote on. Bryan Carson liked this on Facebook. No one in this state is safe while the legislature is in session. @Myra Ain’t that the truth! Best place for that collection of asshats to be is adjourned. Or perhaps lost at sea somewhere.